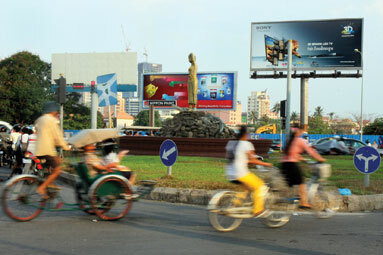 Motorists drive past the Neang Kong Heang roundabout near the Olympic Stadium in Phnom Penh yesterday. City Hall has announced a 90-day project to expand the road around the roundabout . Phnom Penh Municipality will start a 90-day construction project today to expand the roads around a heavily trafficked roundabout near the Olympic Stadium in Prampi Makara district. According a statement from the municipality’s website, traffic around the Neang Kong Hing roundabout has drawn the ire of local motorists. City officials say they have received “so many complaints from [the] public about its current condition”. City Hall approved a plan on March 3 that would see several changes to the current location. The plan calls for expansion of Street 169 and Street 182, and the relocation of the roundabout to the corner of Wat Preah Put. New traffic lights are also to be installed, along with the addition of new driving lanes. A municipality letter signed yesterday and issued to residents living near the project site in the Prampi Makara district’s Veal Vong commune, asked them “to be patient during disturbances from the construction activities”. The letter further requested that “residents who live near the construction site cooperate in moving and removing all affected buildings in order for the construction process to run on time”. Som Sovan, Prampi Makara district governor, said yesterday that the road expansion project would pose no threat to area residents’ homes but would only affect pavements. “The construction only affects state land, and we’ll expand the road four or five metres into the Olympic Stadium [grounds],” he said. 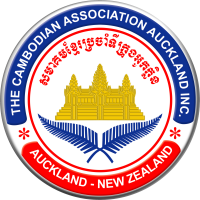 The municipality statement said the intersection had been “under adjustment” by the Asian Development Bank in 2003, but that its directions had now become difficult for motorists to follow.